The 2015 Polaris RZR Mint 400 presented by General Tire will undoubtedly go down in history books as one of the most competitive races in recent off-road history. Fifty-one Trick Trucks and thirty-four Class 1500’s rolled in to Sin City ready to throw down on the brutal Best in the Desert race course. 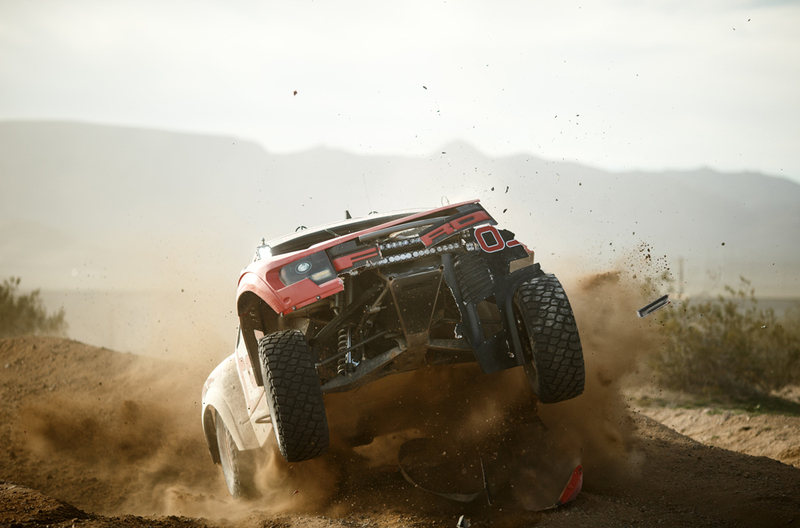 After a momentary stoppage in the race due to a multi-vehicle collision, it was apparent that The Great American Off-Road Race would carry on past dusk, shifting the focus to visibility into the night. 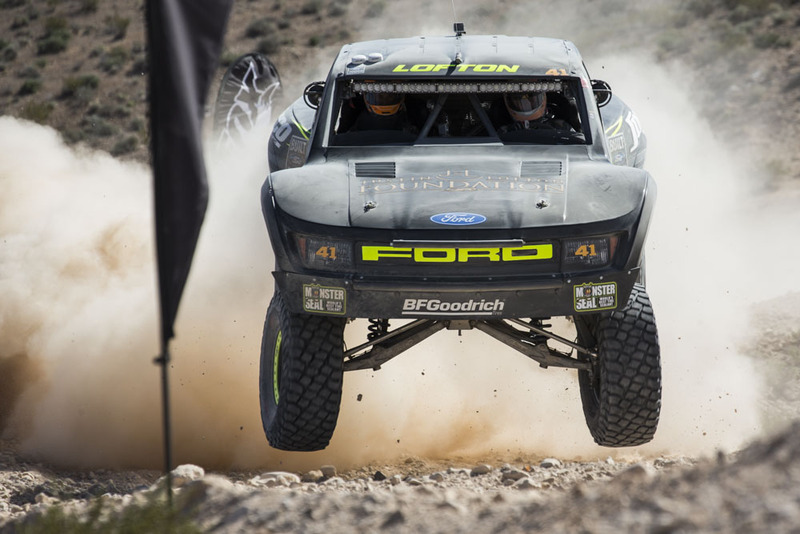 With the help of Baja Designs Off-Road Performance Lighting, Justin Lofton, Sam Berri and Brett Sourapas were able to push until the end and secure the Overall Victory and 1st place in Class 1500 and Class 6100, respectively. After making the move up from Class 1500 to the Trick Truck Class, Justin Lofton has proven his newly built Jimco Trick Truck can race with the best. As if the deteriorating Mint 400 race course wasn’t tough enough, racers had to quickly shift to nighttime strategies after the first stoppage of a race in Best in the Desert history forced the race to push further into the night. 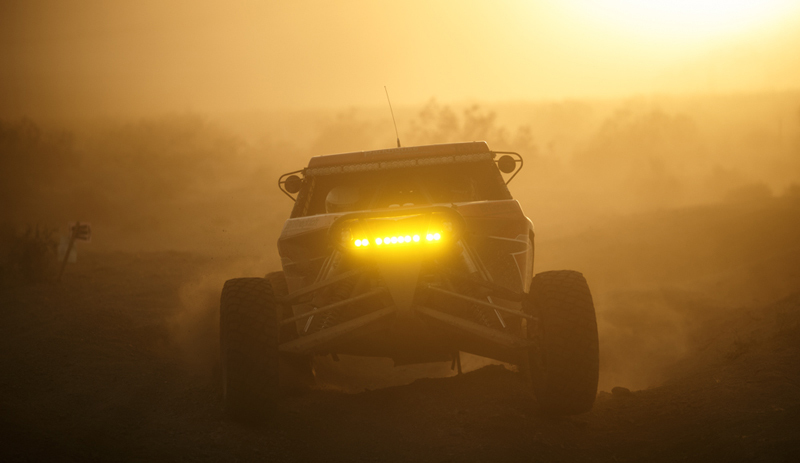 A Baja Designs OnX6 Racer Edition Arc Series LED Light Bar guided Lofton over the finish line after completing the 400 mile course in just under six hours, 7 minutes ahead of the 2nd place finisher Robby Gordon. Similar to Justin Lofton, Sam Berri also has a brand new Jimco Class 1500 built for the 2015 season which has been outfitted with Baja Designs OnX6 Racer Edition LED Light Bars and Squadron Pro auxiliary lights. Berri ran a flawless race and was 1st to the finish line with an official time of 06:24:27.431. The list of accomplished Baja Designs racers with strong finishes at the 2015 Mint 400 doesn’t stop there. Tavo Vildosola was a frontrunner the entire day and finished 5th overall. Tavo finished the race just seventeen minutes off Lofton’s pace. Dan, Luke and Andy McMillin also demonstrated the effectiveness of Baja Designs Lighting with 6th, 7th and 13th place overall finishes. Hot off their win at the BITD Parker 425 earlier this year, TSCO Racing’s Gary Weyhrich finished with an impressive 8th place at the Mint 400. Baja Designs racers secured 8 of the top 10 positions in the combined overall rankings in addition to top tier finishes in Trick Truck, Class 1500 and Class 6100 placing Baja Designs in the forefront of the off-road lighting industry. 5th – #21 Gustavo Vildosola Jr.
Fourteen seconds separated Berri from Baja Designs teammate, Cody Parkhouse. Parkhouse was fourth fastest at qualifying and went on to contest Berri as the two lead 1500 vehicles. Terrain conditions combined with Berri’s pace was too much for Parkhouse, who ultimately ended up in second place in Class 1500.#6119 Brett Sourapas secured Baja Designs a third win at The Mint in the 6100 Class with his dominating 06:48:47.691 run, over twenty minutes faster than second place. After winning the opening Best in the Desert race in Parker, AZ, this was Sourapas’ first finish at night in 2015. 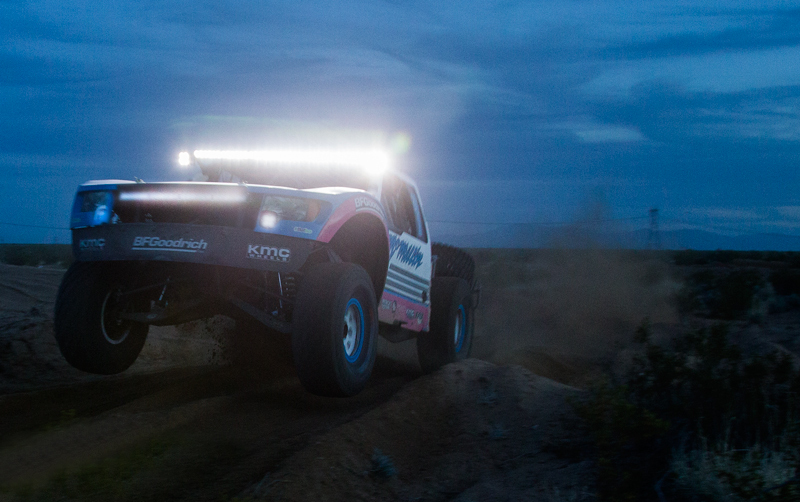 With the help of the farthest projecting LED light bar in the industry, Sourapas is now 2 for 2 after winning the 2015 Mint 400. Baja Designs advocates, #6103 David Kleiman and #6183 Jeff Terzo, rounded out the podium with 2nd and 3rd place finishes in the 6100 Class. For 20+ years Baja Designs (BD) has engineered revolutionary ways to stay at the forefront of motorcycle and automotive lighting. The first product developed was a Dual Sport kit that made a pure off road motorcycle minimally street legal. This intimate knowledge of motorcycle electrical capabilities led to a natural evolution to engineer the first HID motorcycle race light. Owner/Lead engineer Alan Roach and Product Development Engineer Stephen “Tex” Mitchell were avid Baja 1000 motorcycle racers who were able to fine tune a motorcycle’s limited light optics to maximize rider comfort, speed and safety. As a result, Baja Designs (BD) has won every professional and amateur motorcycle and ATV Baja 1000 class for over 15 years. As their engineers and racers advanced to truck and buggy racing, the next evolution began. The engineers quickly adapted their race winning HID motorcycle lights to their new race vehicles. 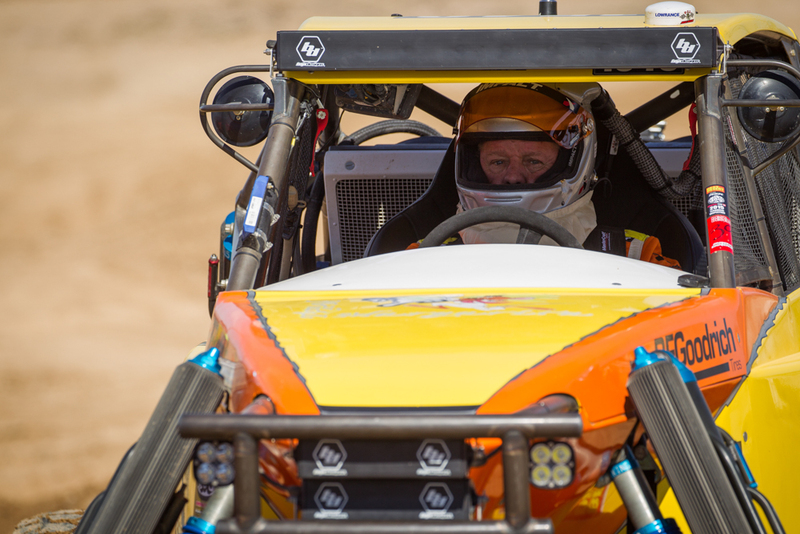 With amazing speed, Baja Designs (BD) HID lights were adopted by the vehicle race community and could be found on the majority of Baja 1000 winning vehicles. In the process, Baja Designs (BD) engineers became well known as “The Scientists of Lighting” and were sought out by professional race teams to develop and aim their vehicle lighting. 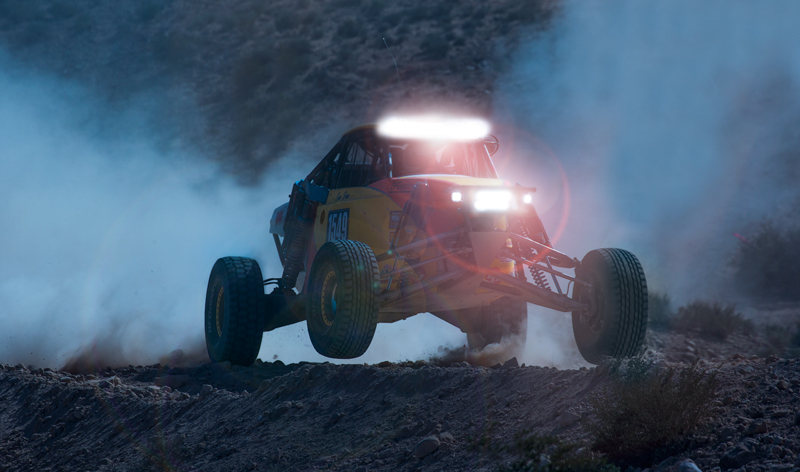 LED lights were the next natural evolution of lighting and Baja Designs (BD) was the first company to develop a forward projecting LED light bar that was introduced and raced in the 2005 Baja 1000. That original LED light bar has evolved into a line of the highest performing and race winning LED lights on the market. Revolutionizing industry leading lights is not just a job at Baja Designs (BD), but a lifelong passion for both their owners and employees. The Baja Designs (BD) product line is dedicated to being BRIGHTER, BOLDER, and BETTER, which is why they truly are “The Scientists of Lighting”.